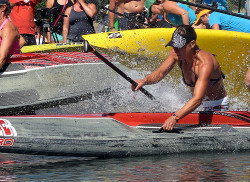 The first ever Canadian SUP Championship was held in conjunction with one of the biggest Canadian SUP races, The Kalamalka Classic in Vernon, BC on August 30th/September 1st. 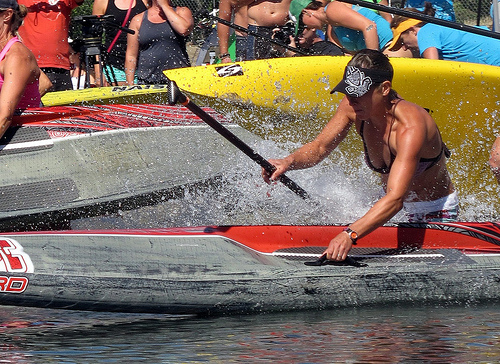 More than 150 paddlers participated across the weekend in the short course, sprints, team relays and the classic paddle across Kalamalka Lake. There were many trophies to be won from Queen and King of Kalamalka to various Canadian Championship titles. Day 1 was the Wikiholo short course for the elite racers. There were heats of eliminations and then a final round for the men, while the women used a cumulative points system without eliminations. In the women’s race it was Lina Augaitis who took the win, followed by Shannon Bell and then Lysanne Lavigne. On the men’s side the competition was tight with Stu Robinson taking the win followed closely by Norm Hann and Mike Darbyshire. Day 2 saw he crossing of the lake race, which was the Canadian Championship event, as well as the culmination of the overall Queen and King titles. On the female’s side it was Lina Augaitis who won the 14ft class as well as the overall Queen of the Lake title. Shannon Bell won the 12’6 ft class. For the men it was Stu Robinson taking the win for the 14ft class, followed by Norm Hann and Mike Darbyshire. Stu Robinson took the overall King of the lake title as well. James Thesiger won the title for the 12’6″ class. Gary Parsons and Mary Lou Brisco won the masters category and Eli Fischbuch and Mia Wheatley took the Junior titles. Full results are below and there’s also a great recap of the weekend by Queen of the Lake and rising star of the women’s racing scene, Lina Augaitis, over on her personal blog.